Here’s something I’ve not seen tried yet elsewhere: a look at how the watercolour illusion (see three posts back) appears when reversed out, black to white. Update 16/12/12: My mistake! Here’s a report of an earlier study that does include reversal of the illusion. It’s by Aula Dostoevsky and Ken Knolbauch. 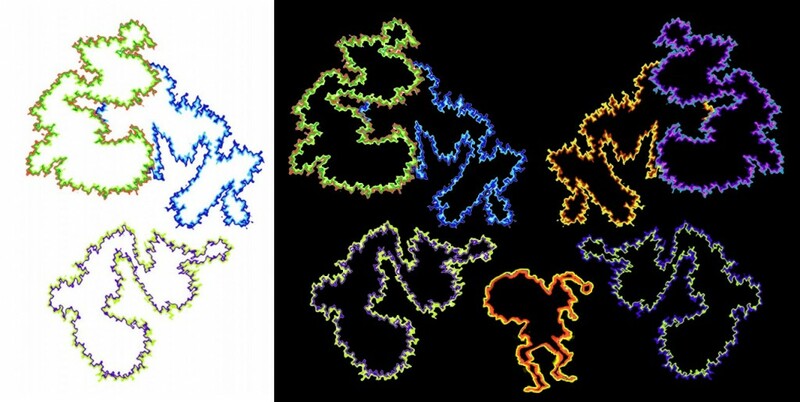 In the original effect, as seen to left, islands with two-tone outlines seem tinted with the colour of the inner tone, if lighter than the outer, and otherwise appear (as in the lower figure) whiter than the background. Sure enough, as seen centre, the effect is still there, but a bit weaker, when exactly the same two-tone outlines are placed on black. The upper interiors, which seemed tinted on white, appear (to my eye) blacker than the black background. The lower interior, which looked whiter than background on white, now appears tinted. In other words, on white the haze spreads from the paler outline, when the darker outline encloses it, whereas on black, the haze spreads from the darker outline, and when enclosed by a paler outline. Consistent with that, to my eye, on the right when the colours of the two-tone outlines are reversed on black, the interior that appeared tinted in the centre lower figure appears blacker than background. The upper figures, with interiors blacker than background in the centre, look tinted to the right. The effect is strongest for me in the three lower figures, looking across the whole image. (Ignoring the Santa figure, added for seasonal effect). For me the effect also works best slightly larger, so click on the figure to see a larger version.